This community-wide food drive takes place each year on the 2nd Saturday in May. 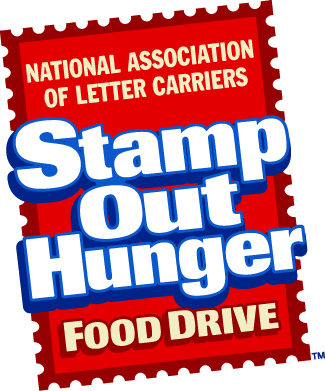 All community members and area businesses are invited to participate in one of the largest community-wide food drives of the year – the annual Stamp Out Hunger food drive, sponsored by local members of the National Association of Letter Carriers and the United Way of Bemidji Area. Area businesses are invited to sponsor a workplace food drive, collecting non-perishable food items and bringing them to the 401 Irvine Avenue NE Post Office by the Friday prior to the community-wide collection on Saturday. Community members are asked to simply leave a sturdy bag containing non-perishable foods, like canned fruit, canned tuna, canned vegetables, pasta, rice or cereal, next to their mailbox prior to the time of regular mail delivery that Saturday. Food items should be in non-breakable containers, such as boxes and cans. Bemidji letter carriers will collect the donations and deliver them to the Bemidji Community Food Shelf.